Struggling with your child’s tantrums? 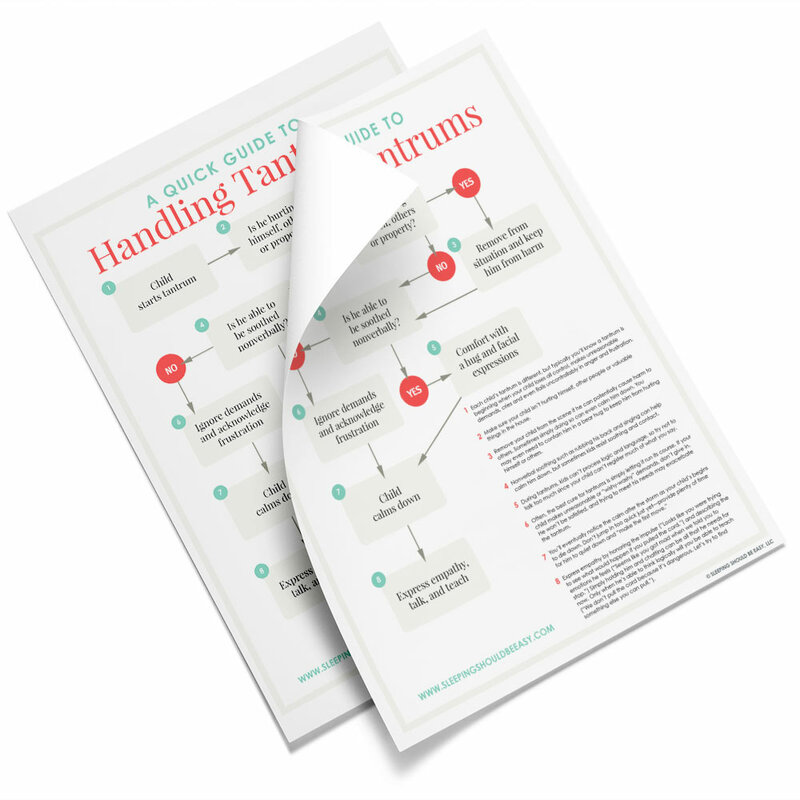 Get a quick guide to helping kids having tantrums and learn what to do when they happen. I felt helpless. My son had been throwing a tantrum… for over an hour. Nothing worked. I tried soothing him to no avail. Completely ignoring him didn’t do the trick, either. I seem to leave every outing carrying a wailing toddler, making my quick getaway. We’ve all been there. The defiance, the crying-so-hard-they-can’t-breathe, the flailing of the arms and legs. They happen in the privacy of our homes or under the glaring eyes of others in public. 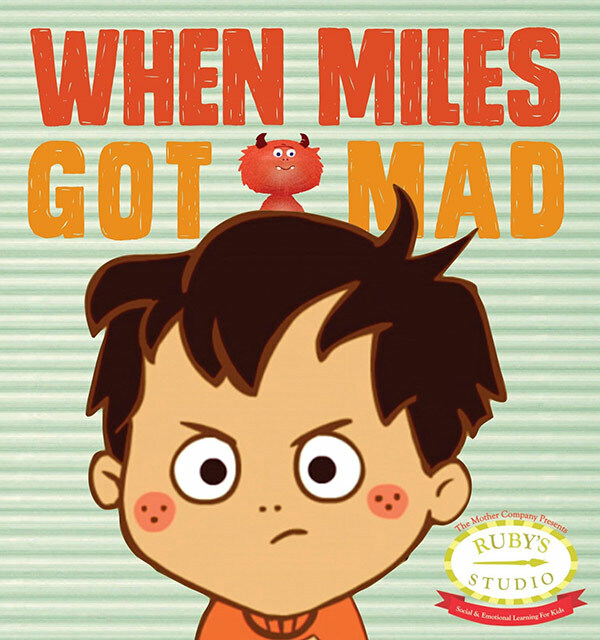 No matter where, dealing with toddler temper tantrums challenges even the calmest of moms. And while tantrums will happen, we have ways to cope when one smacks us in the face. Sure, there’s temperament. Even among my kids, I can see differences in how each one reacts and what ticks them off. What works for one may not work for the others. But we can handle the situation better using other means. To lessen their frequency and their intensity. To prevent them from happening in the first place. Each child’s tantrum is different, but typically you’ll know a tantrum is beginning when your child loses all control, makes unreasonable demands, cries and even flails uncontrollably in anger and frustration. 2. Is he hurting himself, others or property? Make sure your child isn’t hurting himself, other people or valuable things in the house. Remove your child from the scene if he can potentially cause harm to others. Sometimes simply doing so can even calm him down. You may even need to contain him in a bear hug to keep him from hurting himself or others. Removing my son from the situation—even stepping to another room—was enough to calm him down. Before, attempting to temper his frustration right then and there made him angrier. 4. If not, is he able to be soothed nonverbally? Nonverbal soothing such as rubbing his back and singing can help calm him down, but sometimes kids resist soothing and contact. If he lets you, continue to rub his back or be nearby. If he doesn’t want you to hold him, then step away and let him know you’re here when he’s ready. During tantrums, kids can’t process logic and language, so try not to talk too much since your child can’t register much of what you say. I learned that holding and reassuring my son of our love shortened the duration of the tantrums. Disciplining, reasoning, and even talking him “out of it” seemed to make them worse. Often, the best cure for tantrums is simply letting it run its course. If your child makes unreasonable or “wishy-washy” demands, don’t give in. He won’t be satisfied, and trying to meet his needs may exacerbate the tantrum. Once he’s calm and listening, acknowledge how he feels, and why. “It doesn’t feel good when I tell you what not to do, does it?” you can tell him as you hold him in an embrace. “You can be sad with me.” Let him vent—don’t punish him for the emotions he feels, even if the experience is unpleasant for you. Express empathy by honoring the impulse (“Looks like you were trying to see what would happen if you pulled the cord.”) and describing the emotions he feels (“Seems like you got mad when we told you to stop.”) Simply holding him and chatting can be all that he needs for now. Only when he’s able to think logically will you be able to discipline (“We don’t pull the cord because it’s dangerous. Let’s find something else you can pull.”). 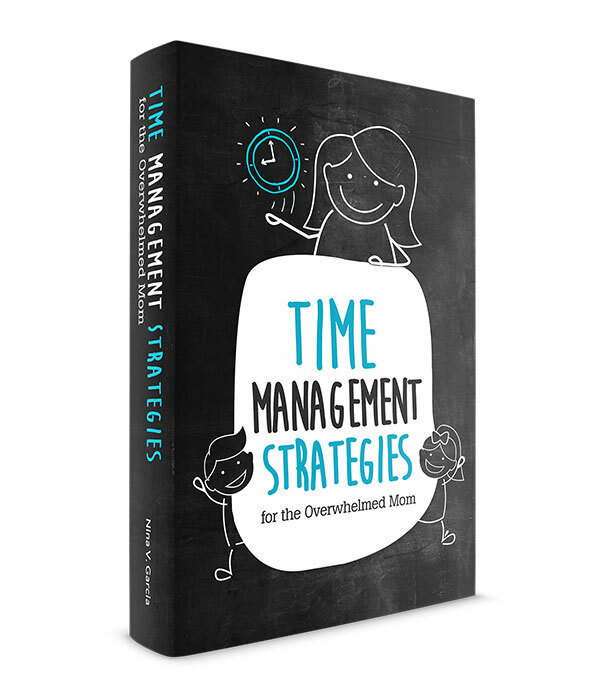 Every child is different so this guide isn’t a comprehensive, one-size-fits-all solution. But this process has helped our toddler cope with tantrums. Meanwhile, it’s important to stay calm. The more agitated we are, the worse they spiral down. It’s so easy to react and respond with anger at your kids when they’re driving your nuts. But here’s the thing: you need to hold your ground. Tantrums scare our kids. If they can unnerve even you, if their own parents can’t help them through their toddler temper tantrums, then who will? Besides, staying calm is more effective than yelling. Think about the last time you yelled versus when you stayed calm. No matter how difficult it was to keep the anger controlled, your child’s tantrum probably ended a whole lot faster than when you yelled. So long as you give them attention when they behave, they won’t equate misbehavior as the only way to get it. They’re sorting through new emotions and don’t understand why we’ mean during tantrums. When we lose our temper, yell or get upset, they might think we love them only when they’re happy. They learn that certain emotions can seem “bad” in their parents’ eyes. This isn’t to say that their behavior is acceptable. Wanting to eat the dog’s food or dump a bucket of water onto the floor isn’t allowed. Establish limits and stick to it. But you’re still on their side. So while their actions and behavior may not be good, your kids always are. And they need to know and feel that. I may just be jinxing myself again here and end up with another tantrum the minute I publish this article. But I’ve been happy with the way we’ve handled his recent outbursts. Hopefully you’ll find the guide just as useful should you have a toddler throwing a tantrum. 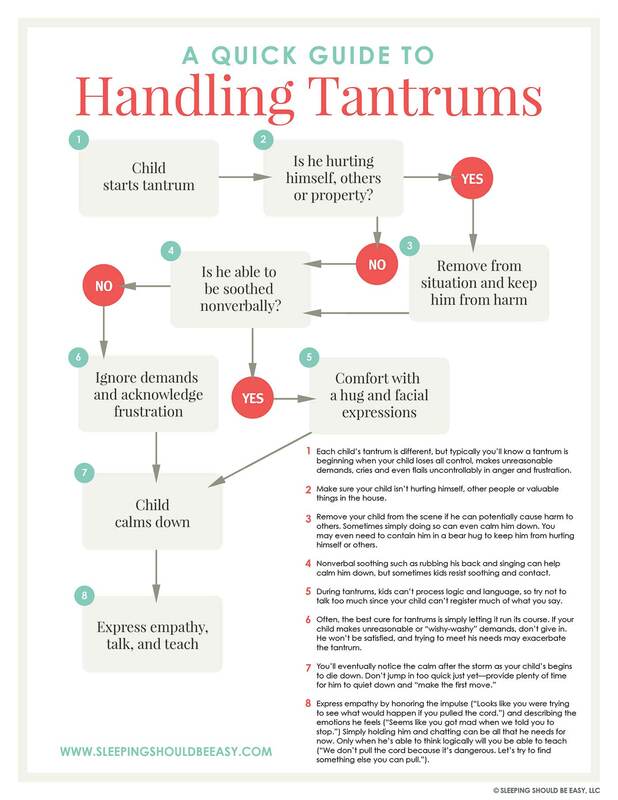 Do you have a process for helping kids having tantrums? How does your child react to soothing, talking and other methods of calming down during a tantrum? Baguette had her first tantrum a week ago. Prior to that, I’d been able to interrupt them before they really got going, but this one just blossomed out of nowhere. It wasn’t really nowhere, of course–she was tired and frustrated. But so far she does respond well to verbal calming (I always start with the quiet “shh-shh-shh-shh” I used to calm her as a newborn), and that and a snuggle eventually calmed her down. At some point, she’ll have a tantrum that can only be resolved by stepping back and letting her melt down. I’m hoping that’s not soon, though. People keep telling me that they’re kids had a harder time when they were three than when they were two. 🙁 I’m really hoping it’s not true! It has been a long time since I’ve had little ones who threw those kind of toddler tantrums. Years down the road you will have fun teenage fits to look forward to. However, remember what you just wrote about how you, as parents, now have experience in the trenches. We all learn while being parents, when our kids are young, like yours are or when they have “grown and Flown,” like ours. I’ve heard the same—that all this fun defiance comes back with a vengeance during the teen years. Oh, help me. I like the “chose the direction” format for your guide. How can the 3s be any worse. My girl has a flair for the dramatic and throws herself down on the floor doesn’t matter where. She’s not too shy to throw down a tantrum anywhere. One thing I do is just stay calm. Right now I feel like she is in a constant state of whining. I really don’t know how to get her to stop and I feel like I’ve tried everything! This is fantastic! What a great tool. I will not only use this when the tantrums become common (they are only in the early stages now), but I will pass this onto our Child Development teacher at the high school. What a great poster to hang in her classroom. Thanks for sharing this with everyone. You rock, Oster’s Mom! Thanks so much; I appreciate that. Very helpful graphic! I think this is worth printing out and hanging up, as we can often lose our resolve when these tantrums erupt!